TRADE MARK / IMAGE RIGHTS Artistes A Las Vegas company co-owned by Leon Hendrix, brother of rock icon Jimi Hendrix, has succeeded in Trade Mark litigation with the company that licenses Hendrix music and trademark – companies controlled by Leon Hendrix’s sister by adoption Janie Hendrix. U.S. District Judge Thomas Zilly said that a 2008 Washington state law that would have provided a “right of publicity” to Experience Hendrix LLC and Authentic Hendrix LLC was unconstitutional. The ruling appears to strengthen the rights of the Las Vegas company — formerly known as HendrixLicensing.com, doing business as Hendrix Artwork and Hendrixartwork.com — to sell Hendrix merchandise. The Jimi Hendrix licensing companies control the Jimi Hendrix music, recordings and artistic properties and have federally-registered trademarks including rights to the phrases “Jimi Hendrix” “The Jimi Hendrix Experience” and certain logos. In 2009, Janie Hendrix’s companies sued Pitsicalis, HendrixLicensing.com, Hendrix Artwork and Hendrixartwork.com in federal court in Seattle, alleging trademark infringement because those companies were using the Hendrix name and selling Hendrix-oriented merchandise, allegedly in a manner “designed to capitalize on the goodwill and source recognition associated with the Hendrix family companies’ marks and rights.” Merchandise includes artwork, posters, t-shirts and home decor items…. IMAGE RIGHTS Artists Tom Waits has reached a settlement regarding his dispute with German car maker Opel and their advertising agency McCann Erickson. Waits claimed that the car firm had deliberately used a sound-alike on one of their TV ads to imply he had participated in the marketing campaign. The singer sought an injunction to stop the ads and at least $300,000 in damages. The exact nature of the out of court settlement is not know, though Waits has pledged to donate the money he will receive to charity. Confirming they had reached an agreement with the singer, McCann Erickson said yesterday: “We respect Mr Waits, and deeply regret any embarrassment this may have caused”. The settlement comes almost exactly one year after Waits won a similar court case in Spain where Volkswagen had also used a sound a like in a TV ad. Waits, famously critical of artists who take the advertising dollar off big business, said after yesterday’s settlement was announced: “I’m glad to be out of the car sales business once and for all”. 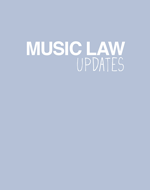 IMAGE RIGHTS Artists ARTICLE – A new article on image /personality rights by Ben Challis will be published on Music Law Updates (under Articles) at the end of January 2007. In this article Ben examines current developments in the law in the United Kingdom which could be used to support the concept of a coherent ‘image right’ for celebrities. But Ben asks whether it is time for legislation to govern an area of such of obvious economic importance with s stand alone ‘image right’.